Oil-rich Nigeria ground to a halt Monday amid mass demonstrations and strikes protesting a government decision to end billions of dollars in fuel subsidies that saw pump prices double overnight. At least 20 people were wounded and at least three demonstrators were reportedly killed as police opened fire on protests in the country's business capital, Lagos, as well as in the largest northern city, Kano. 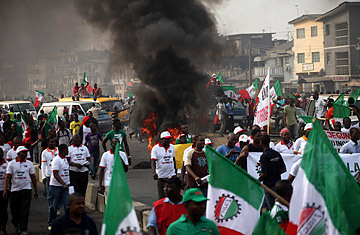 Witnesses said police also attacked protesters with batons and tear gas overnight in the capital, Abuja. Banks, airports, gas stations and markets were closed throughout the country on Monday as streets in some of Africa's largest cities, normally blocked solid by traffic, were quiet but for the sound of protests. The violence against protesters comes in a security climate already clouded by mounting Muslim-Christian tensions that have seen an upsurge of sectarian violence in the north. The demonstrations mark the start of what is expected to be a drawn-out battle that protest organizers have called Occupy Nigeria, adopting the brand name franchised by the Wall Street protests against economic inequality. But while the fuel-price hikes  and their knock-on inflationary effect on the cost of food, power, telecommunications and other essentials  may impoverish poorer Nigerians in the short term, government economists say ending subsidies is essential to the long-term prospects of reducing poverty. The subsidy cut has become the acid test of whether or not President Goodluck Jonathan will succeed in his effort to reform the economy of Africa's most populous country, and one of its most corrupt. Nigeria's economic plight, as well as the failure of its political leadership, is encapsulated by the fact that despite being Africa's largest producer of crude oil (ranked fifth among suppliers to the U.S.), it relies on imports for almost all of its own gasoline requirements. The ineptitude and corruption of successive governments has allowed Nigeria's own refineries to rot: funds allocated for maintenance and upgrades have gone missing, not least because annual subsidies to make imported fuel affordable  which amounted to $8 billion in 2011  have earned fortunes for politically connected fuel importers, while killing off any incentive to regenerate domestic refining capacity. Almost all of the 2 million barrels a day of crude oil pumped in Nigeria is exported, while four domestic refineries operate at less than 25% capacity, according to industry estimates. And crime is rife: militants, state officials, army officers and others all siphon off crude oil to sell on the black market, while imported fuel is smuggled out of Nigeria and sold to countries where, without subsidies, fuel is three times the price. But for many ordinary Nigerians, the import subsidy amounts to the only tangible benefit from their country's oil wealth, and they've previously fought  and won  battles to prevent its removal. Jonathan vows that this time, however, the government will not back down. "If I were in your shoes at this moment, I probably would have reacted in the same manner," he said in a speech on Saturday. But reform, and the fight against corruption, must take priority, he said, adding he would use the money saved to improve Nigeria's decaying infrastructure. "The deregulation policy is the strongest measure to tackle this challenge in downstream sector." As a gesture to skeptics, who say his administration is no less corrupt and self-aggrandizing than its predecessors, he also pledged to reduce salaries of all politicians in the executive branch, which exceed their counterparts in the U.S., by 25%. Many Nigerians agree with Jonathan's diagnosis of Nigeria's problems but question his methods. "How can you ask people to tighten their belts when you run an obese system?" asked one protester via Twitter. Many believe money saved from the handout withdrawal will go straight into government coffers. "The politicians are using the money from oil to enrich themselves instead of rebuilding our country," said protester John Paul from Benue state in the southeast. "They are talking of building a new refinery, but our current refineries do not even work. They should fight corruption, not the fuel subsidy." Gbenga Bojuwomi, a member of the Youth Reformation Group Nigeria, added: "Why does everything boil down to the masses? Why should we suffer for the mistakes of the government?" At least for now, the credibility of Jonathan's presidency rests on whether Nigerians accept his answers to those questions. See photos of a bombing in Nigeria.